United States Forensics is positioned to be the largest provider of computerized biomechanical analysis of motion in the medical/legal marketplace. 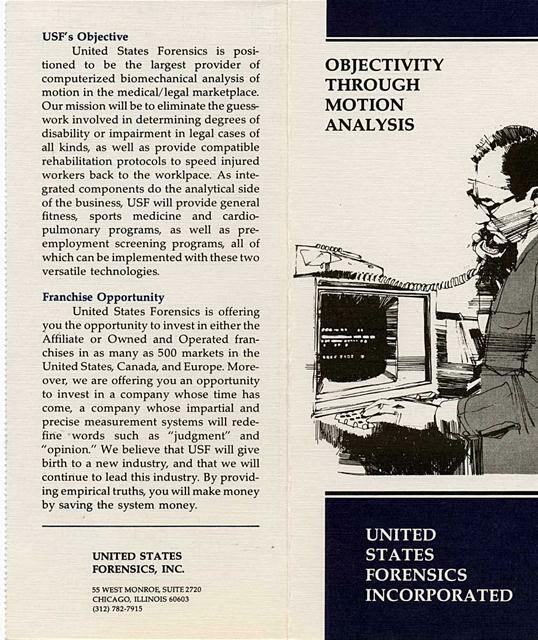 United States Forensics is positioned to be the largest provider of computerized biomechanical analysis of motion in the medical/legal marketplace. Our mission will be to eliminate the guesswork involved in determining degrees of disability or impairment in legal cases of all kinds, as well as provide compatible rehabilitation protocols to speed injured workers back to the worklpace. As integrated components do the analytical side of the business, USF will provide general fitness, sports medicine and cardiopulmonary programs, as well as preemployment screening programs, all of which can be implemented with these two versatile technologies. United States Forensics is offering you the opportunity to invest in either the Affiliate or Owned and Operated franchises in as many as 500 markets in the United States, Canada, and Europe. Moreover, we are offering you an opportunity to invest in a company whose time has come, a company whose impartial and precise measurement systems will redefine words such as "judgment" and "opinion." We believe that USF will give birth to a new industry, and that we will continue to lead this industry. By providing empirical truths, you will make money by saving the system money. United States Forensics is a company made up of research scientists, physicians, and attorneys dedicated to applying the principles of computerized biomechanical analysis and two derivative technologies to the medical-legal marketplace. Computerized biomechanical analysis is the study of motion through Newtonian physics and state-ofthe-art computer technology. 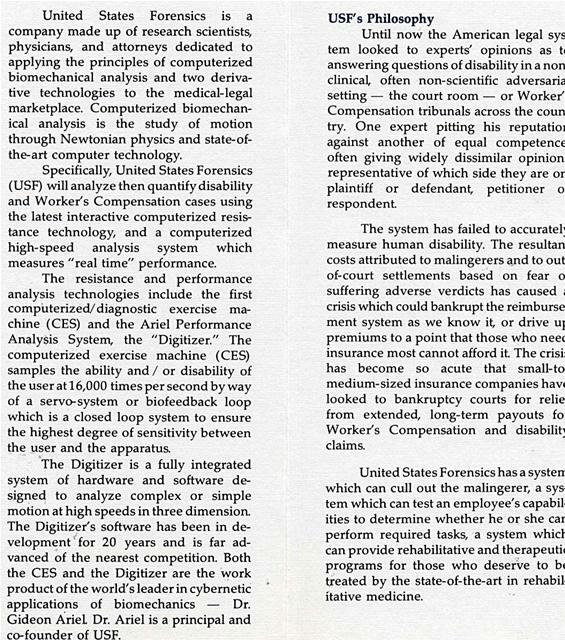 Specifically, United States Forensics (USF) will analyze then quantify disability and Worker's Compensation cases using the latest interactive computerized resistance technology, and a computerized high-speed analysis system which measures "real time" performance. The resistance and performance analysis technologies include the first computerized/ diagnostic exercise machine (CES) and the Ariel Performance Analysis System, the "Digitizer." The computerized exercise machine (CES) samples the ability and/ or disability of the user at 16,000 times per second by way of a servo-system or biofeedback loop which is a closed loop system to ensure the highest degree of sensitivity between the user and the apparatus. The Digitizer is a fully integrated system of hardware and software designed to analyze complex or simple motion at high speeds in three dimension. The Digitizer's software has been in development for 20 years and is far advanced of the nearest competition. Both the CES and the Digitizer are the work product of the world's leader in cybernetic applications of biomechanics - Dr. Gideon ArieL Dr. Ariel is a principal and co-founder of USF. Until now the American legal sys tem looked to experts' opinions as tc answering questions of disability in a non clinical, often non-scientific adversaria setting - the court room - or Worker Compensation tribunals across the coun try. One expert pitting his reputation against another of equal competence often giving widely dissimilar opinion: representative of which side they are or plaintiff or defendant, petitioner o: respondent. The system has failed to accuratell measure human disability. The resultan costs attributed to malingerers and to out of-court settlements based on fear o suffering adverse verdicts has caused crisis which could bankrupt the reimburse ment system as we know it, or drive of premiums to a point that those who neec insurance most cannot afford it The crisis has become so acute that small-to. medium-sized insurance companies have looked to bankruptcy courts for relies from extended, long-term payouts foi Worker's Compensation and disability claims. United States Forensics has a system which can cull out the malingerer, a system which can test an employee's capabilities to determine whether he or she car perform required tasks, a system whicl, can provide rehabilitative and therapeutic programs for those who deserve to be treated by the state-of-the-art in rehabilitative medicine. Generated on 4/24/2019 9:44:09 AM (PST) ADI/HQ/GBA/2019/ARIELCLOUD/v3.0.2018.0126.